Yarn: About 140m of heavy worsted or aran weight wool. I used Debbie Bliss Cashmerino Aran and needed a ball and a half. Needles: 4mm (US6) 16″ circular or DPNs; 4.5mm (US7) 16″ circular and DPNs. Gauge: 5 stitches per inch on 4.5mm needles. Note – this pattern is worked in the round, but you can work it flat if you prefer. It doesn’t make a whole lot of difference, except that you will have a seam up the back if you work it flat. 1. Cast on 90 stitches using 4mm needles. Join in the round, being careful not to twist your stitches, and place a marker to show the beginning of the round. 2. Work in K2, P2 rib until work measures two inches. 3. Purl one round. 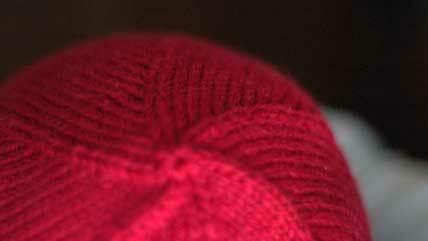 Then, switching to 4.5mm needles, work in st. st. until work measures seven inches. 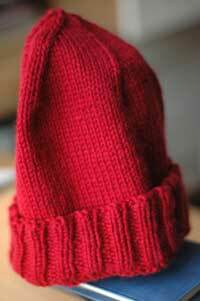 This length takes into account that you turn the ribbed brim up. If you prefer not to turn the brim up, stop when your work measures five inches. 4. Next row: *K 13, K 2 tog, repeat from * to end of round. Then knit one round plain. Next row: *K 12, K 2 tog, repeat from * to end of round. Then knit one round plain. Next row: *K 4, K 2 tog, repeat from * to end. Next row: *K 3, K 2 tog, repeat from * to end. Next row: *K2, K 2 tog, repeat from * to end. Next row: *K 2 tog, repeat from * to end. Last row: Cut your yarn, leaving a tail, and using a darning needle, draw the tail through the remaining stitches. 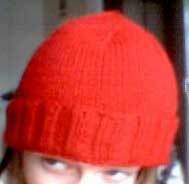 Bring the needle and tail through to the Wrong Side of hat and sew up the hole from the inside. Weave in ends. Here are some other shots – the last one is from my little webcam so the quality isn’t great but my normal camera refused to take a picture of my entire head with the hat on it.